I decided to have another bash at getting my iFilte to fly. It’s a vented iFlite 1. But no luck. I’ve tried it indoors, outdoors with no wind, and outdoors in a very light breeze. But whatever I try, it sheers away to one side and then plunges to the ground. The rigging looks somehow wrong. The spreader seems to lay back too far. Maybe I’ve got it set up wrong? Trouble is, I can’t find any reference online to show me how it should look, and how I should be flying it. Its probably me! But I can fly my Hybrid, my Doug Stout Hawk and my home-made Rogallos, no problem. I Googled iflite kite and looked at the images. Plenty of photos that I think will be helpful, both framing and bridle. I thought I saw a video once on how to set up an iflight? Maybe it was linked to one of the kite shops pages where iflight was sold? Anyone else feel like they have seen that? It might help, I will poke around and see if I can find it. I've got 2, had 3. The spreader goes out front and the bridle should clear everything. It's meant mostly for indoors and for gliding. Make sure there are no twists in any of the spreader connections and that the bridle goes outside the spreader. The line that holds the spreader should be centered after assembly, you may need to move it. Unless you have moved the tow point, it should be very close to what it should be. To smooth mine's flight out, I've used a piece of slightly heavier line between the kite and flying line. You should be able to get the kite high in the sky (20-30') and it should just glide down with out "hobby-horsing" too much. Adjust that heavy piece to take that behavior out by either adding or shortening that bit of line. 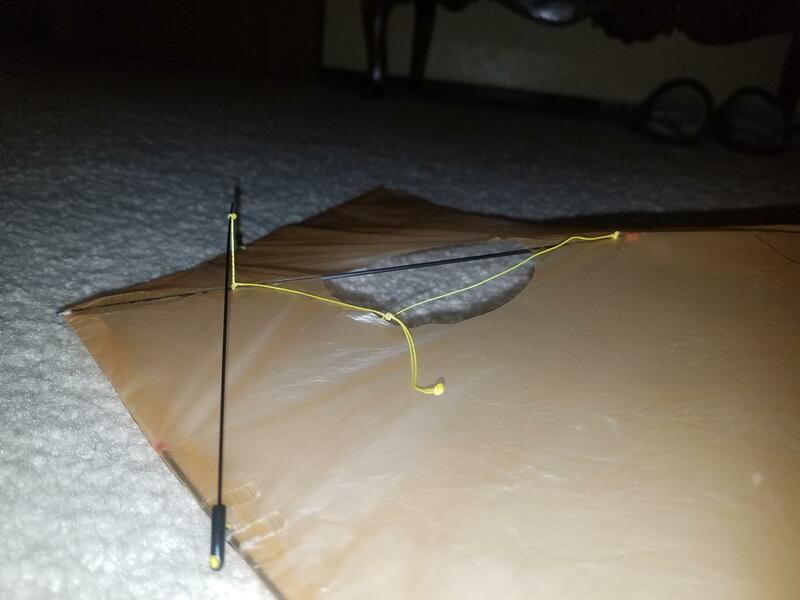 I have 2 iFlite 1s - no vent, had a iFlite II that got sun damaged and the sail turned to powder. Love them! Miss my II. PS: what weight line are you trying to fly on? I use something in the 30# range, you could go higher or lower, but there's really no need. IMHO light line works best. Hi Mark. Thanks. I’ve looked,and there are lots, you’re right. Nothing close up, though, and particularly nothing with a side view so that I can see the rake (if any) of the spreader. The spreader on mine leans way back towards the tail, but I suspect it should be more or less perpendicular to the cover. I’ll try to upload a side-on snapshot later; see what you think. 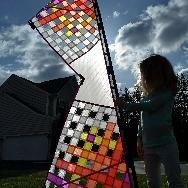 But one of the images led me to YouTube video by the maker showing how to assemble the little kite, and I seem to have that about right. This is probably the video that you refer to, ACrop. I found it useful in that it confirms I’m doing something right, at least. Wayne, when you say the bridle goes outside the spreader, do you mean that the triangle enclosed by the three attachment points (tow point and two on the spine) does not contain the spreader? If yes, then I’m ok there. I have moved the tow point (I’ve tried most things I can try), but its now back at about 45-50 degrees. That’s a good idea about a heavier trace at the start of the line. At the moment I’m using 10lb Spectra, but I could easily strip in a yard or so of Horvath’s stuff. I’ll try that. Yes - the spreader should be separated not tangled in the bridle. Remember to center the line from the spine holding the spreader. I think it should be pretty much straight across from the wingtips and not leaning towards the tail though. Check that both attachment caps are free and not twisted. There should be a smooth bend to the spreader. Let me get mine out and measure how far from the sail it is after assembly. Sorry no pix - my 'puter skills are crap. Are you on FB?? I use the same screen name there. Send me a pm there and I could use my phone to share pix? OK - Measured mine - about 1" off the sail for spreader. Above and clear of bridle. Line centered. Mine sits pretty straight, maybe leans to nose very slightly. Top leg of bridle about 2 1/4", bottom leg 4 1/4". All measurements approximate. Don't know if yours was marked, but I made a Sharpie mark to indicate "home" and use it as my baseline on the bridle. I can always return there if any adjustment doesn't work. PS: #154 white sail here. Don't know how many 1000's he's made, but mine is one of his early ones!!! If you are on FB, Patrick does have a page setup - iFlite the windless wonder. Lots of pix, not sure on a setup video. Dedicated page to his iFlites. May also be helpful to post a photo of your kite here, as it appears when ready for flight - could be something obvious we’ll see immediately. Maybe. OK, here are some different views. You should be able to make out the bridle angle, the attachment of the "sockets" for the spreader, and the angle that the spreader adopts relative to the cover. In the landscape picture, it looks as if something is awry with the leading edge. In fact, the channel was rumpled. I've straightened it out now, since taking the photo, but it makes no difference to the rigging or the flight. Have you replaced the spreader - it looks much too long! Mine is a shade under 9" long, metrics would tell exactly. Or pm Patrick Tan and ask. That looks much too long from the pic. While you're at it - ask him the diameter of the spreader too. From the pic it looks a bit thick. Did you center the line from spine to spreader? The spreader should form a straight line wingtip to wingtip about 1" off the sail. Mine echoes all of those measurements. Also, the spreader is exactly 9" long tip to tip – must be the camera angle. The z-line is exactly 1" long, but somehow the spreader lays back so that it sits only about 11/16ths above the spine. Patrick had marked the bridle, and I measure this at 50 degrees. In the video we found, he says set it between 45 and 50 deg. Mine is #2332, so substantially junior to yours. OK, so mine's a bit shorter, but not much. Have you tried re-centering the endcaps for the spreader? Make them more equal side to side, leftside, right side? Not offset on the wings? Have you tried replacing the pixie dust? The original may be worn out -- it has a 3-year half-life when exposed to kites -- or it may have come from a weak batch when it was made. I have 1-quart jars available at $49.95 USD + shipping . This will last the average flyer a lifetime as long as it is properly stored. Also available in 1-pint containers at $29.95 USD + shipping for the weekend warriors. I've had it available in 55-gallon drums for the pros but never had a taker. The dust I sell is 100% full-strength undiluted pixie dust with no additives. Guaranteed to get your kite higher than it's ever been. Sprinkle just a pinch between the spar and tail and you're good to go. The short lead that comes from the spine to the spreader goes straight up and down on mine. Yours seems to tip way back. That length is about 7/8" long on mine, and the spreader is 9". I'm not sure what would cause it to lean back. No, nor am I. If I knew, then I imagine I'd be able to think of a way to straighten it. And it seems to change the whole aerodynamic profile of the kite – which is probably why it just doesn't want to fly. My short lead (the z-line), is about 1", but if i shorten it to 7/8" by winding a turn around the spreader, it overtensions the cover. Make sure to check both end caps where the spreader goes for twists or ?? Make sure they lay straight and are not all fudged up, forcing the spreader to lay funny. Thanks, Wayne. But I've done that. They lie perfectly in line and equal one side to the other. I've pm-ed Patrick Tan and am hoping he responds. We shall see. Just got off FB chat with Patrick - his suggestion is that the "z" line may have come untied and doesn't create the dihedral the wings should form. Since you're on FB, try reaching him on chat and leave him a pic of the kite assembled, from the nose, on its back. He should be able to help!! Added you to our FB chat - feel free to ask questions there!! Well, after some frantic FaceBook dead-of-night messaging between myself, Wayne D and Patrick T, I seem to have found the answer to the problem. Patrick described how to increase the dihedral by some microsurgery, which in turn made the spreader stand more proud of the sail. With a bit of tweaking now I think I can get this little bird to fly pretty – already it's performing much better than it did. Thanks everyone.